At the last helicopter count (Spring 2012) there were 2411 stags, 3963 hinds and 1322 calves on the ground. 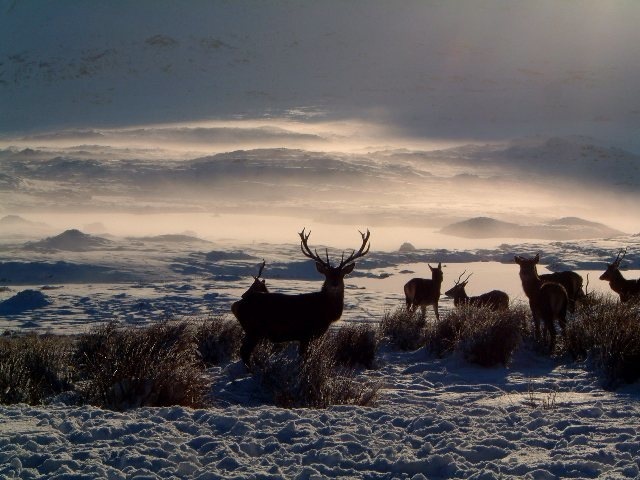 The average population density of less than 5 deer per sq km is one of the lowest in Scotland, reflecting the large proportion of the area that is dominated by relatively infertile peat bogs and high mountain tops, but there are a number of more fertile locations, especially Ben Loyal, where deer densities are much higher, and this variation is important in understanding the overall dynamics within the Group area. There are small numbers of roe deer in the wooded areas of the Group, but the wider area is too harsh for them. Sika deer are established in woodlands towards the south of the area. Group members have been trying to prevent them from spreading. There are no fallow deer in the area.